Caustic 3 has been released and it is now also available for iOS devices. Now all the packs on this page are in the new causticpack format designed to make it easier to import presets and samples on Android and iOS devices! They can also be used with Caustic 2 though it requires some extra work. Click this link for more info: causticpack installation. The packs on this page can either be downloaded or bought bundled from Sampleism or individually from Google Play. If you get them from Google Play, they will be installed automatically to your Android device. If you get them from Sampleism, you will have to install them yourself to your Android or iOS device, computer or PlayBook. The same files work on all platforms. The detailed instructions on how to install them are above and also included in the downloads. - Free pack 01: 4 PCMsynth instruments and 2 Beatbox kits. If you like the sounds in it, visit the pages of the source sample packs but note that they DO NOT contain other presets/instruments for Caustic: Out There (Beatbox), Memory Collections (Mini MC1) and Reed Organs (Supertone LITE). But they all include the wav files, and the Out There set soundfonts too, that can be imported in Caustic. - Free Pack 02: 2 different sets of quirky and fun sounds, the Mini MC2 kits and the Mechanical Musical Automatons for a total of 12 PCMsynths presets and 4 Beatbox kits. - Single Cycle waveforms free pack: 30 single cycle waveforms and 63 presets for the PCMSynth of Caustic. Even if these waveforms can be used as is, they take a new dimension when shaped with the PCMSynth controls. I have added 3 simple example presets. 1- Mix: 27 instruments covering a range of different timbres. 2- Metal: 13 metallic sounding instruments. 3- Cymbals: 9 resynthesized acoustic cymbals/hi-hats. It has a free demo. - Square Wave: 13 PCMsynth presets and 2 Beatbox kits. The hardware electronic keyboard sampled here is a digital square wave instrument. I don't know exactly how old it is but my guess is that it's at least 20 years old. It has 12 chromatic sounds, bass and 5 percussion sounds: kick, conga, snare, cymbal and hi-hat. All these do not sound like the acoustic instruments they're named after but more like the Sid chip, 80's and early 90's video games. Very good retro sounds for chip music (or chiptune). View or download the PDF HERE. It has a free demo. - Prepared EP: The free demo pack has 16 samples, 16 PCMSynth presets and 4 Beatbox kits. The paid pack adds 63 samples, 53 presets and 25 kits for a combined total of 79 samples, 69 PCMSynth presets and 29 Beatbox kits. Both must be installed to have the complete content. The sampled instrument is a real electric piano that was prepared as John Cage and others prepared an acoustic piano. That means inserting springs, plastic tubes, pins, all kinds of objects inside the piano. These objects when touching the strings or the tines change the sound of each key played. All the notes can be radically different from each other and often the original sound is not even recognizable. The result is an instrument that is much more percussive in nature. - Baby Piano (toy piano): The Baby Piano is a Chinese Toy Piano. I found it at a flea market and it obviously has seen better days. There are 2 keys missing, its casing is worn out and there are loose parts in it. The sound is not even from one key to another partly because the mechanism of some keys is damaged and it's also not in tune. It's nonetheless lovely and its sound begged to be sampled. I did not stop there and I also made unique resynthesized sounds from the original samples. 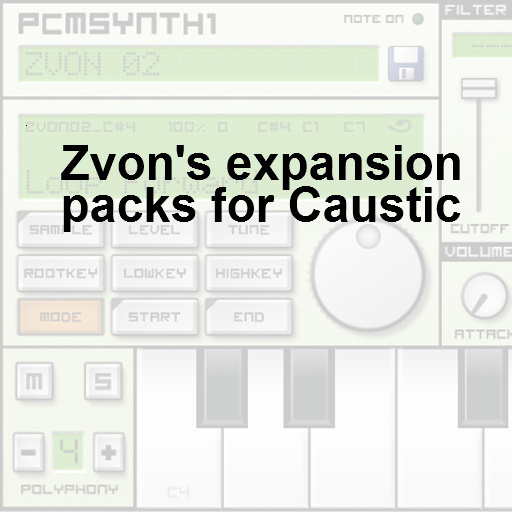 The Caustic version is optimized for the PCMSynth from the regular computer version. The paid pack adds 9 PCMSynth presets to the 5 of the demo for a combined total of 14. All are multi-sampled. Both must be installed to have the complete content. - Julie Resynth: A fun cyborg vocal sample set, half human and half robot! This pack is based on one-shot samples of the voice of Julie, a Montreal jazz singer. But here the samples are resynthesized to create new ones that are playable chromatically across the keyboard. The more extensive computer version (wav, soundfont, sfz and Native Instruments Kontakt 3) is HERE. - Marching Band Horn: The exact name of this instrument is unknown. It uses a French horn mouthpiece and the range is a little lower than a trumpet and a little higher than a trombone. To make most of the instruments in this set I played single notes and resynthesized them to create multi-samples. In all cases the resulting tone is still very brassy and close to the natural one. For more info, view or download the PDF HERE. The demo has 7 PCMSynth instruments and the full version adds 30 for a total of 37 instruments. Most are multi-sampled. Both the demo and the full pack must be installed to have the complete content. - Acoustic Guitar: A simple, good sounding multi-sampled acoustic guitar bank for the PCMSynth. The guitar had steel strings and was played with a pick. Recorded with 3 different microphones simultaneously: a condenser, a ribbon and a guitar pickup. "On the other hand, after having done a test pattern, it sounds VERY natural, probably because of these imperfections... For me, it's really cool to have something that sounds so natural... it's a REAL recording of an imperfect instrument." Four chords, first with the condenser mic set, followed by the ribbon mic set and the pickup set, Chords reverb - patterns ribbon mic dry - condenser with chorus, delay and reverb - with overdrive - pickup overdrive. All FXs are from Caustic. Watch more demo videos on YouTube HERE. Visit our forum on KVRaudio.